From Sendai Airport to Sendai JR station, we have a train (630 yen), 30min. You can come from Narita airport by JR and Keisei Line. See detail from R. Saito's page. You can walk on foot (20min). From Sendai station, Follow the footpath under archade (brown color). 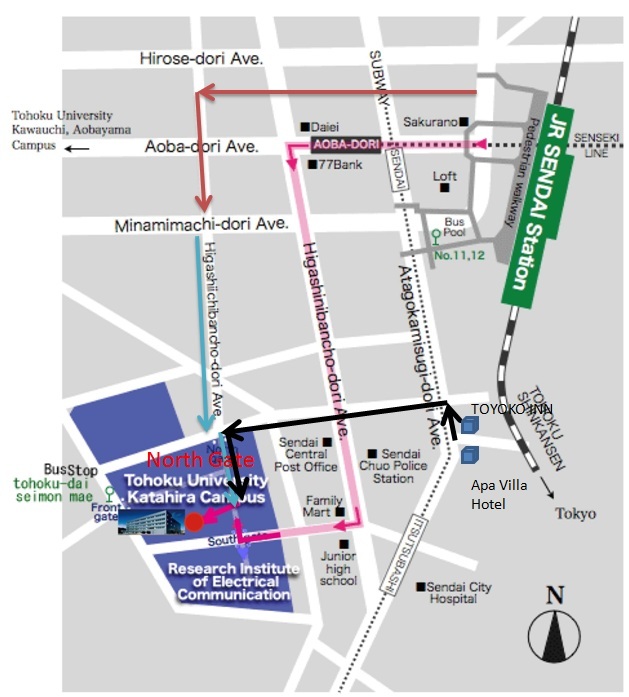 There is a department store (Fujisaki) at the left when you will turn to the left. It is the end of archade in the direction from the station. Then you will have another archade to the south. After ending the archade, you will walk more (blue color) without archade to arrive the north gate. If you have luggages, take a Taxi (5min) 1,000 yen. You need to say "Katahira, Tohoku Univiersity." and exit at Kitamon (North Gate) 東北大学 片平地区 北門. 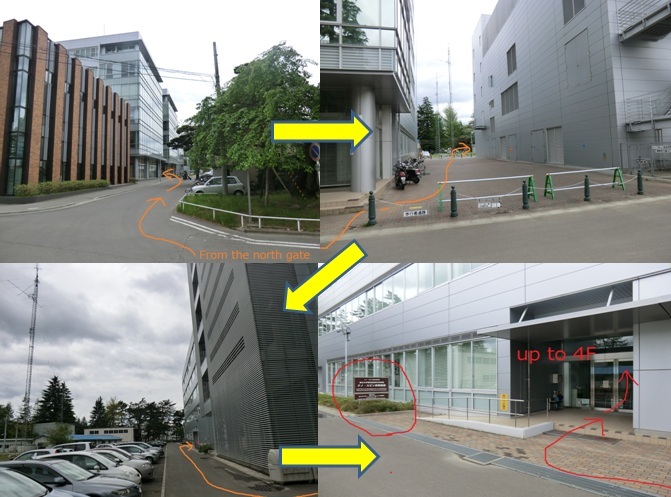 (1) from the north gate of the Katahira campus, go straight (200m) up to the brown building (Sakura hall) at the right hand side. Turn to the right. (2) Then turn to the left between two building. (3) Turn to the right. You will find antenna and parking place. (4) Find Nano Spin builiding sign and enter this building and take escalator up to 4th floor.